What’s the advantage to Invisalign®? Invisalign, which we happily provide at Unterseher Orthodontics, is a great alternative to traditional orthodontic treatment if you've been apprehensive about the thought of metal braces. During your initial visit, the first thing we do is take an impression of your teeth as they are now and digitize it. Using special software, we look at the current positioning of your teeth and compare it to the way your teeth should look. Invisalign treatment, which consists of a series of aligners that you switch out approximately every couple of weeks, can help patients with crowded teeth, crossbites, overbites, underbites and more. Invisalign gradually shifts your teeth into place, creating the dazzling smile you’ve always wanted. During treatment with Dr. Ronald Unterseher, patients wear the aligners all day and night, except for during meals and when they’re brushing and flossing; cleaning your teeth and eating are a snap since you can easily remove your aligners! And because they’re clear, no one will know that your teeth are steadily straightening! To find out if you are the right candidate for Invisalign treatment, we invite you to give us a call at our convenient Westminster or Denver office and schedule a consultation. If your old holiday routine has gotten stale, leave your green T-shirt in the drawer and try one or all of these tips. Don’t be surprised if you have so much fun that you decide to start a new, annual St. Patrick’s Day tradition! 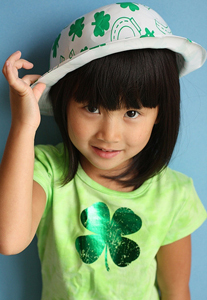 Have a happy St. Paddy’s day from Unterseher Orthodontics! Contrary to popular belief, orthodontic treatment is not just for older children and teens who have alignment and spacing issues. At our Westminster or Denver office, orthodontic treatment offers many benefits for children at a young age. Dr. Ronald Unterseher can identify your child’s alignment issues early, and provide treatment as the teeth begin to develop. It’s crucial to start dental care early, not only for proper dental health and cosmetic benefits, but to improve your child’s overall health. Aside from cosmetic benefits, starting orthodontic treatment at a young age offers many other advantages. A pediatric dentist can help guide the teeth into their proper position to prevent teeth extractions or bite problems, and even reduce the extent of orthodontic treatment later on. Your youngster will enjoy the confidence of having straight teeth that, as an added bonus, will be easier to clean. Parents will be happy to hear the earlier your child gets treatment, the less your orthodontic expenses could be; plus, it is often covered by dental insurance. Multiple stages are included in early orthodontic treatment, but there are three main stages. Stage 1: Treatment starts around age two or three until the child is around six. This stage includes preventive measures to avoid habits that lead to crooked teeth, and monitoring how the teeth grow in. Stage 2: The first permanent teeth appear around age six to 12 years old and the dentist looks at possible early treatment for misalignment or bite issues. Stage 3: Any further problems with permanent teeth are corrected during adolescence. Dr. Ronald Unterseher and our staff are able to see early on whether your child will need to have braces in adolescence. Early treatment means fewer procedures, cleaner teeth, and less expense for parents. It’s a win-win for everyone! If you are an adult considering braces, our team at Unterseher Orthodontics will tell you Invisalign aligners will give you the best of all worlds. Your teeth will be straightened with virtually invisible braces. You can remove your aligners when you eat so you can enjoy any food you normally would consume. You do not have to worry about embarrassing yourself by getting food stuck in your braces. You simply clean your teeth normally after eating and replace your aligners. If there is a special occasion during which you do not want to have any braces at all, you can remove the aligners for a few hours without causing any damage. Dr. Ronald Unterseher and our team know that teenagers are often involved in contact sports or gymnastics. Others find that having metal in their mouth interferes with their ability to play a musical instrument. Traditional metal braces contain wires and brackets that can cause damage to the mouth and gums; this is not a risk with Invisalign aligners. For more information about Invisalign or Invisalign Teen, or to schedule an initial consultation with Dr. Ronald Unterseher, please give us a call at our convenient Westminster or Denver office!